One of my favorite things to do with my stamps is to find other ways to use them, or to use them "out of the box". When I was playing with the new Window Shopping set from Taylored Expressions, I discovered something interesting that I wanted to share! I had stamped the one window on a smaller piece of paper in order to layer onto a card. I went on to pick out paper and when I went to look for my stamped window, the paper had been turned upside down on my desk and I looked at it and thought "Hey, that looks like an aquarium!" And so this idea was born! So, I colored the "aquarium" and the "gravel" on the bottom. Then I inked and stamped the fish from the Fish in Love stamp. None of the sentiments from the Animals in Love Sentiments set conveyed the message I wanted to get across with my discovery, so I started lookin g at all of my Taylored Expressions stamp sets and came across Sweet Occasions. How perfect would "Congrats on your sweet new place" be for two fish who bought a new aquarium! LOL Anyway, I thought it was a cute new way to congratulate someone on a new house. . .and another way you can use your windows in the Window Shopping set! Hope you enjoyed my tip! This is SUPER UBER COOL!!!!!!! 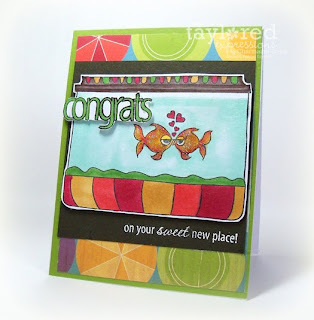 I LOVE the out-of-the-cox use for the window and how you combined these very different stamp sets!!! You're amazing!!! Very cute card. Great way to think outside of the box. How clever! It also looks like it could be a jar or even a hot-air balloon basket! Charmaine that's awesome!!!! I think we need a set of aquarium accessories now!